Ms. Wheeler is not the touchy-feely kind when she describes scientists and technicians in Antarctica during the 7-month that she spent with them in science camps. She turns awes and wonders into a refreshing set of stories about people and places. At a fast clip she surprises with delightful encounters describing a different breed of people in a different land. “Terra Incognita” is not all ice, mountains, deserts, and hardship, but it is about the people who live and work there. As a scientist I felt at times described like a caged animal on display in her writing. She pokes fun of subjects and self that the feeble may not always like. Her book made me laugh and smile often. It still does. The people in Ms. Wheeler’s book reminded me of many companions that I lived with in close quarters working on Arctic research vessels and out of remote field camps. She succeeds to show the essence of men and women who live science. With humor and gripping commentary she depicts the human side of science well. This is travel writing at its very best, ever since Bruce Chatwin stopped writing. 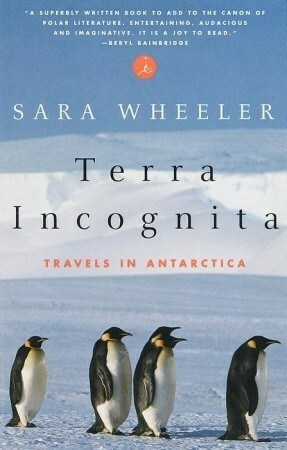 Along with Ms. Wheeler’s first book “Travels in a Thin country” that is Chile, “Terra Incognita” reflects a healthy thirst for life, people, and wanderlust. This entry was posted in Polar Exploration and tagged Antarctica, Sarah Wheeler. Bookmark the permalink.